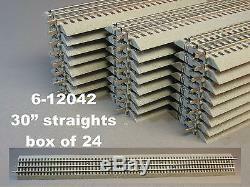 L ionel O/027 gauge brand new Fastrack Standard 30 Inch Straights! Includes: ON E BOX of 24 Pieces of 30 Straight Track. Price is per CASE of 24. Order as many cases as you like. Standard 30 Inch Straight Section. Lionel FasTrack System has a Built in Roadbed for easier assembly, quiet operation, and direct on carpet operation. These are new from a set. Will run your Lionel, Kline, MTH, Weaver, MDK, or any O/O27 trains! And receive our final invoice to pay. All items must be paid within 7 days. The item "LIONEL FASTRACK 30 INCH LONG STRAIGHT TRACK FULL CASE O GAUGE 6-12042 (24) NEW" is in sale since Monday, May 13, 2013.